Posted By:Unknown | At:10:47 AM Be the first to comment! (Mother Jones) Herman Cain, appearing on ABC's This Week, offered Perry the most mild of rebukes considering he's old enough to recall what life was like when segregation was the law of the land. "I think that it shows a lack of sensitivity for a long time of not taking that word off of that rock and renaming the place," he said. You might have anticipated that Perry would face a firestorm for being associated with the property, but it's Cain whose remarks are drawing the most criticism from the right. 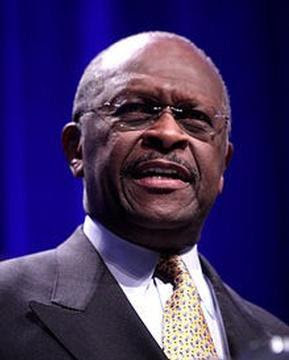 At RedState, Erick Erickson concluded, "It also seems to be a slander Herman Cain is picking up and running with as a way to get into second place." Glenn Reynolds remarked that until now, Cain's "big appeal is that he's not just another black race-card-playing politician." Over at the Daily Caller, Matt Lewis called Cain's remarks "a cheap shot, and, perhaps a signal that Cain is willing to play the race card against a fellow Republican when it benefits him." I mean how dare they accuse Uncle Herman of such a thing? Don't they know he'll throw his own people under the bus to prove he is one of them? How dare they treat him like this? He had a temporary lapse in judgement, but I can guarantee he'll be back to his regular self-hating ways. I promise. Just give it a minute.